Continuing the acclaimed series of choral collections for smaller choirs, this invaluable and economical compilation from Lorenz is a perfect solution no matter how few in number or vocally unbalanced your faithful choir may be. Contributing composers include Mark Burrows, Victor Johnson, Lloyd Larson, Mary McDonald, Joseph Martin, Larry Shackley, Jean Anne Shafferman, and Ruth Elaine Schram. All God's Children Gotta Sing! This versatile collection compiled by Lloyd Larson is designed with the needs of small choirs or those with limited rehearsal time in mind. It is ideal for intergenerational choirs, senior adult choirs, or any group of people who love to sing. Composers include Ruth Elaine Schram, Lloyd Larson, Mary McDonald, Larry Shackley, Jean Anne Shafferman, and Natalie Sleeth. Songs include: "Fount of Every Blessing" (Larson); "Go Ye Therefore" (McDonald); "Good and Simple Gifts" (Sleeth & Shafferman); "Lord, I Know I Been Changed" (Shackley); "My Shepherd Will Supply My Need" (Larson); "Sing a New Song to the Lord" (Sleeth & Shafferman); "Stand Up!" (McDonald); and "That Promised Land" (Schram). Accompaniment CD available. Perennial Best Seller! Versatile song arranged for two part any combination, based on the beloved Psalm 100 text. Moderate ranges and singable lines are perfect for children's voices (flute doubles part I up the octave), youth, adults, or senior adults. Suitable as a call to worship or anthem during the service, this joyous celebration of music is partly set as a round, making it easy to learn with minimal preparation while sounding deceptively difficult. A touch of syncopation and a lively keyboard part give this "Alleluia" a fine vigor and energy. As a pure expression of the joy of singing, this selection will be very appealing to a young mixed choir or treble group. This beautiful, enduring praise anthem will be a favorite of your choir and congregation! The simplicity of the text is underscored by fluid accompaniment. Scored for SAB with a fourth part cued in the bass clef to easily adapt it for SATB choirs. Beautiful, flowing song of praise for SAB voices, but with a limited bass clef range that makes it suitable for youth as well as adults. Simple, memorable text by Linda Walker. Ruthie has arranged the "prequel" to her very popular "America the Beautiful" (BL276), skillfully setting "America" (My Country 'Tis of Thee; Thesaurus Musicus, words by Samuel F. Smith) for three-part mixed chorus and optional baritone. Beginning with an optional intro, the song starts a cappella and builds verse by verse to a powerful conclusion. While it is magnificent on its own, an alternate ending that enables a segue into her arrangement of "America the Beautiful" creates a stirring patriotic medley. Suitable for church or school use; perfect for Memorial Day or July Fourth services. Commissioned by the Midland High School Chorus, Midland, Michigan (Robert Sabourin, director). The classic patriotic piece has been arranged by Ruth Elaine Schram for church or school use. Perfect for July 4 weekend, Labor Day Weekend, Memorial Day Weekend, and other Sundays when we observe national holidays. The optional baritone in the mixed voicing make this setting especially useful for holiday weekends when your choir loft may not be completely full. Equally suitable for church or school use, this delightful melding of three spirituals allows opportunities for young, developing choirs to create beautiful tone quality while preparing for an artistic performance. The comforting message of guardian angels watching over us begins with "All Night, All Day," then glides into "In the morning, when I rise ..." and concludes with "Every night when the sun goes in ... Angels watching over me...." For mixed or treble voices. This practical collection for men's voices features old and new anthems that should be staples in any choral or small ensemble library. It includes Ruth Elaine Schram's arrangement of "Come Ye Sinners" for TB voices and may be ordered directly from the publisher. This collection offers diverse musical selections for choirs of all ages and abilities from high school through adult. The high quality and accessible music will be useful to church, college and community choirs. The volume contains a cappella settings as well as gospel settings with piano and voicings from unison to SSAA, including Ruth Elaine Schram's SSA arrangement of "Oh, Mary, Don't You Weep". It may be ordered directly from the publisher. Adaptation of the beloved scripture passage in Psalm 46. The dynamics range from soft and contemplative to strong and powerful. This piece is suitable for general use, or for worship services exploring the character of God where a reverent anthem is desired. Absolutely gorgeous benediction by David Gaines and Ruth Elaine Schram, based on Psalm 90. Suitable any time of year, available in two voicings. "Blessed Assurance" (incorporating the beloved hymn by Fanny Crosby and Phoebe Knapp) is a joyous proclamation of God's faithfulness and our trust in His provision for our salvation. The gospel feel gives the song its lilt that is fun to sing and hear. Suitable for use any time during the church year, and written in two part treble voicing, it is accessible for mixed choirs (suggestions for voicings are given), treble voices, senior adults, youth, women's or men's choirs. Ranges are moderate and much of the song is in unison, unison with descant or countermelody. There is minimal part writing, so it can be easily and quickly prepared when rehearsal time is limited. "Blessing and Benediction" is a flexible piece that quotes the Sarum Primer (God Be In Your Head) and incorporates the beloved Lutkin work, "The Lord Bless You and Keep You." Instructions are given throughout which allow choirs to use only the Blessing portion (Measures 1 - 27) or only the Amen portion (Measures 43 - 53) of this work, and the section incorporating the Lutkin Benediction may be done accompanied or a cappella. It would be suitable any time of year as a full-length anthem or (in whole or in part) as a benediction. This fun setting of J. Paul Williams' adaptation of John 6:32-40 is upbeat and rhythmic. The Island-flavor music by Ruth Elaine Schram includes optional percussion parts and hand claps which make the message of this scripture passage come to life. Psalm 9:1-2 is set to the lovely Irish hymn tune "St. Columba," adapted and arranged with a Celtic flair. Piano accompaniment is augmented by a delightful (optional) flute part for this gently moving song of praise. A wonderful parting blessing for any occasion! The soothing movement of the 6/8 meter, combined with lovely melodic writing for flute or other C instrument provides the perfect setting for this benediction anthem of hope and comfort. "May the face of God go before you. May the grace of God now be with you. May His goodness and mercy follow you all the days of your life ..."
This anthem based on Psalm 47, would be an appropriate selection for a call to worship at the beginning of the service or as a festive anthem of praise during the worship service. The song begins rather softly and increases gradually to fortissimo at the end, but is accented and full of intensity throughout. Both keyboard and voices are as percussive as they are melodic. Hand clapping and improvisation on Orff instruments would be appropriate additions to this piece. Arranged by John Purifoy. Expressive, thoughtful text by Ruth Elaine Schram set to a lovely melody by Sherri Porterfield is perfect for general use. "Come unto him as a child; hear with new ears, see with new eyes. Remember the innocence, and come unto Him as a child..."
"Long ago, the Word of God came to the prophets by divine inspiration. To share the news, and to spread the word, they would issue this blanket invitation: Come hear! Come hear the Word of the Lord..." Effective choral writing by Ruth Elaine Schram and Scott D. Schram remind us that God still has a powerful message for all time revealed in His Word. Suitable any time of year. This expressive adaptation of the scripture passage found in Matthew 11:28-30 is suitable any time during the church year. It explores the mystery and awe of God's invitation to each of us to come to Himself and lay down our burdens. Simple yet stately, this anthem based on Psalm 100 works perfectly for any service of thanksgiving or praise. A straightforward piano accompaniment blends nicely with the vocal parts, offering excellent melodic support throughout the piece. An Accompaniment / Performance CD is available. This moving setting of the beloved hymn "Day By Day" (by Caroline V. Sandell-Berg and Oscar Ahnfelt) has been artfully arranged by Ruth Elaine Schram, incorporating the traditional "Peace Like a River." The result is an incredibly moving anthem that will provide wonderful moments in general worship as well as a tender reflection in funeral or memorial services. The song is dedicated in loving memory to Ruthie's precious uncle, Chandler Gage, who walked her down the aisle when she married Scott. Based on Matthew 6:25-34, this adaptation of scripture is set to a bouncing, Caribbean type melody. Optional accompaniment track available features triangle, claves, tambourine, cabasa, and congas. Available for SATB or Two Part voices in any combination. Although written for contest and festival use, this octavo contains two a cappella settings of Latin texts which are equally at home in a liturgical setting. Elegant in their polyphonic texture and in the expression of two different emotions, they may be used separately or together. The wonderful African-American Spiritual has been given a powerful, upbeat treatment in this fresh arrangement by Ruth Elaine Schram. Available in multiple voicings, along with a compelling Accompaniment track. Will particularly appeal to youth choirs. The SSATB revoicing of this best-selling title by Ruth Elaine Schram is her 1000th choral publication, making this an historic printing both for her and for Carl Fischer Music. In the musical lines of the voices and piano accompaniment alike, the "falling" motive of shed tears creates a highly symbolic experience for singers as well as worshippers. This lush, thought-provoking and reflective work calls worshippers to a time of repentance and recognition of what Christ has done for us by His death on the cross. This gorgeous piece is perfectly suited for Communion, Lenten or other services of confession. Stunning, beautiful, and hauntingly memorable! Inspiring, life-affirming work by Ruth Elaine Schram & Douglas Nolan. The text message soars on this beautiful melody! "We thank you, God, for innocence, for childhood dreams, laughter and friends, the strength of youth, the growth of mind. We thank you God for all of life." A marvelous multi-generational anthem, it features adult, youth and children's choirs and senior adults singing as one voice about the joys and sorrows, trials and tribulations of life, making an outstanding home and family anthem as well as a gracious Thanksgiving Day offering. Share this lovely song of gratitude with your congregation, they will be talking about it for weeks to come! The text of the classic Hymn tune is set to beautiful new music by Ruth Elaine Schram. Arranged for multiple voicings, suitable for church or school use. Would be particularly meaningful sung by children in the Springtime. Written for older elementary or middle school treble choirs, this anthem for Mother's Day or Father's Day expresses gratitude for the blessing of parents – from the perspective of a child. Repetitive sections and melodic phrases allow singers to learn the piece quickly. For choirs of two part singers, the anthem's ending includes an optional second vocal part that creates a lovely duet with the expressive melody. The Gift of Home New! Composed for Mother's Day, Father's Day, or any family service, this anthem by Ruth Elaine Schram and Aren Newell Williams highlights important truths about God's gifts of family and home. Melodic repetition throughout the piece makes it easy to learn and allows young voices to sing with strength and confidence. Uplifting original work that thanks the Lord for the gift of music. "We come together to worship, to praise You, Lord. We come together to lift Your Name above all other names. How could we begin to praise You without a song, without the gift of music that You so freely gave? Jesus, we thank You for the gift of music..."
Dancing gently in 3/4 meter, this anthem of thanksgiving reminds us that every good and perfect gift comes from God. Melodic repetition and a recurring refrain make the piece easy to learn and sing. Traditional Latin text and original music (with the option of singing a cappella) by Ruth Elaine Schram make this effective choral work a natural for worship. For SATB voices, this is easily sung, but has big impact with lots of exciting dynamics. Very rhythmic and fast-paced, this would be a perfect Call to Worship for use any time during the year. It would also be terrific as part of your Christmas programming. This energetic medley combines two traditional choruses, "Praise Ye the Lord, Hallelujah," and "Do Lord," sprinkled with references to Handel's "Hallelujah" Chorus! Lively choral call-and-response makes this the ideal piece for teaching choirs to part-sing, and its flexible voicing is great for both treble and mixed choirs of all ages. Speech chorus and stomps and claps add to the toe-tapping fun! Tim Hayden's delightfully orchestrated CD accompaniment track is available. Lovely anthem by Ruth Elaine Schram & John Parker is an affirmation of God's loving presence in our worship services, and our need for His love. "In this room, there is a crying heart; a shattered life, a soul that's torn apart. And in this room, there is a broken home; eyes filled with tears, afraid and all alone. But in this room, there is a loving Lord..." The warm sound of strings (available separately) adds just the right touch to this sensitive musical offering. This versatile anthem may be performed either a cappella or with the optional accompaniment. Based on Psalm 46 and incorporating Martin Luther's "A Mighty Fortress Is Our God," it underscores the strong and protective nature of God, making it a perfect choice for Reformation Sunday. Ruth Elaine Schram and John Parker have teamed up to create this piece that conveys God's promise to never leave or forsake His own. The text is a message of assurance, and is easily prepared for use any time during the church year. Ruth Elaine Schram's father Richard Gage has, according to Ruthie, "always exemplified the greatest level of faith and obedience." That steadfast faith is expressed beautifully in this text adapted from Philippians 4:19. "God never promised us sunshine every day... but God's promises are faithful." Powerful words and fluid accompaniment combine to make this song of assurance in God's provision for us suitable any time during the church year. Optionally include your congregation on the final refrain. Beth Rice Luttrell has crafted a beautiful text which is a prayer of thanks to God for the gift of Christian families, the structure of the Christian family, and familial love which is not only a picture of God's love for us, but an opportunity for us to show God's love to others. It would be a perfect choice for Mother's Day, Father's Day, Children's Day, Christian Family Sunday, or any service with a family emphasis. The optional flute part adds an elegant touch. This text by Ruth Elaine Schram has been set to unique upbeat music by Patti Drennan. The SSATBB (with solo) setting may be done a cappella, or with the accompaniment provided for Guitar, Bass, and Drums. (Piano accompaniment is optional throughout.) The original piece incorporates "Peace Like a River" in an unconventional setting. This piece will require a fair amount of rehearsal, but you'll love the result! This gentle song of commitment expresses the desire for the Lord to grow and mold us into Christ's image. Hymnlike in its writing, the optional second part soars in a descant style creating beautiful musical moments. Consider using the flute for a special effect. Contemporary and powerful, this gospel work based on Psalm 145 is a must for your choir! Beginning (optionally) a cappella, with opportunities for soloists to expressively interpret the verses, the chorus is unforgettable and catchy. Invite your congregation to sing along on the last chorus! Sure to be a favorite! Available in two voicings, with guitar chords included in score for rhythm sections. Will appeal to all ages! "I lift up my heart in praise to You. Of all creation You are King: to You my praises I will sing." Open your hearts to the love of the Lord and show your praise and thanksgiving with this original anthem by Ruth Elaine Schram. Incorporates an adaptation of "Lauda Anima" by Henry Lyte and John Goss. This bright, upbeat pairing of the spirituals "I Ain't Gonna Grieve My Lord No More" and "I Got Shoes" features call and response and simple harmonies supported by a fun, rhythmic piano accompaniment. It is a superb choice for young and developing choirs, and would be very effective in a worship setting. With a sense of comfort and protection from the tender text, this is perhaps one of the best loved and most performed of all gospel songs. Heard in every form imaginable from recording artists to movie sound tracks, this is truly a universal favorite. This beautiful arrangement for SATB or SAB choirs includes the addition of flute and cello parts which add a haunting and lyrical touch to this beautiful choral. Perfect for special services of dedication, memorial and comfort as well as general services any time. Sung with conviction, feeling and gratitude, this choral work will become a blessing to choirs and congregations alike. A solo version is available in the collection "They Could Not" also published by Carl Fischer. Delightful new work by Mark Cabaniss and Ruth Elaine Schram is sure to please. "Better build a boat and step inside, this is gonna be a bumpy ride!" This foot-tapping new spiritual is pure fun, and tells the favorite story of Noah in a fresh new way. Add the optional rhythm section for a jubilant celebration of faith! Optional parts for guitar, bass, and drums included in the score. Superb voice leading characterizes this SSA setting of the Traditional Quaker Hymn. A perfect choice for use any time during the church year. Your ladies will sound warm and sensitive on this flowing setting. In a style reminiscent of a contemporary praise chorus, this simple, understated anthem of praise has a relentless drive propelling it to the soft but earnest "I give you glory." Based on Revelation 4 - 5, suitable any time of year. "I know that one day, every knee will bow; I know that one day, every mouth will praise You, that every tongue will one day confess that You are that Lamb that was slain..."
Uplifting piece that assures us no matter what storms we encounter, God has promised to never let us go. "When the clouds begin to gather, and the rain begins to fall; when the storms are all around you till you cannot see at all, I will hold your hand..." Available in two voicings for mixed ensembles. Based on the beloved passage in Ecclesiastes 3:1-13 and I Thessalonians 5:18, this song encourages us to give thanks to God in everything. "In everything, we give thanks. There's a time to sow, and there's a time to reap, there's a time to laugh, a time to weep, but in everything, we give thanks..." Straightforward without being simplistic, the message is highlighted by memorable music in this anthem of thanks and praise for General, Thanksgiving, or Stewardship use. This versatile original anthem has texts for both Thanksgiving and general use. Solid, accessible four-part writing is supported by a flowing eighth note accompaniment. Lovely and adaptable to meet your needs! This tender ballad reminds us that life and faith are filled with promises: "A tiny bud holds the promise of a flower; a tiny seed, the essence of the grain; a tiny plant holds the promise of the plenty we believe the autumn harvest will contain." In all of these promises, we are reminded of God's providence and presence. It is a message which needs to be sung and heard! "In the whisperings all around, even in the smallest sight and sound we can see reminders of a Holy, loving God..." Suitable any time of year. This set of four introits and four benedictions by Stan Pethel and Ruth Elaine Schram is a useful addition to your choir&apos;s repertoire. Each short choral response includes an optional instrumental part and is quite accessible for any choir. Each selection will surely provide a meaningful beginning or ending to your time of worship. Titles include, "Hear the Glad Sound," "Sing Praise," "Come, Let Us Sing! ", "Rejoice, Rejoice! ", "As We Now this Place Depart," "Let Us Share God&apos;s Love," "Into the Coming Days," and "May the Lord Watch Over You." "Jesus is my Shepherd, Jesus is my Lord. Jesus is my Shepherd, I won't be afraid anymore. Though the darkness is all around me, though my enemies surround me, I will trust in the Lord. I won't be afraid anymore..." Ruth Elaine Schram pairs the familiar "Jesus Loves Me" by Anna Warner and William Bradbury with original words and music. The result is a sweetly uplifting partner song, perfect for times of prayer, dedication, funeral services, and other occasions of intimate worship of the Lord as "our Shepherd" or studies of Psalm 23. In this sturdy arrangement for brass and piano, Ruth Elaine Schram provides a setting that is well-crafted idiomatically for each of the brass instruments. Ideally suited for worship, "Jesus Shall Reign" (with "Crown Him with Many Crowns") features a supportive piano accompaniment that ensures that the brass will play with confidence and strength! The versatility of the well-known hymn tunes (DUKE STREET by John Hatton and DIADEMATA by George Elvey) makes this a resource suitable throughout the entire church year. This smooth pairing of "Jesus, Lover of My Soul" and "Fairest Lord Jesus" is a gracious intertwining of beloved hymn tunes. The flowing vocal lines and fine keyboard part propel the listener toward a hauntingly beautiful ending. This inventive anthem will inspire the choir and congregation alike. Scored for SAB voices with a fourth part cued in the bass clef to easily adapt it for SATB choirs. Melding the two tunes "Wayfaring Stanger" and "Were You There", Ruthie Schram has treated both with reverence in this easy-to-prepare setting. Flexibly voiced for SATB or Two-part Mixed voices, and supported by a forward-moving accompaniment, this anthem is sure to appeal to choirs of all sizes. Performance / Accompaniment CD available. This delightfully amusing recount of the life of the Old Testament prophet, Joseph, is set to the familiar "Yankee Doodle" tune, making this easy to learn for your young singers. From his coat of many colors to his seat on the court of the Pharaoh, this charming, witty children's anthem by Linda Marcus and Ruth Elaine Schram is ideal for worship, chapel, or Sunday School throughout the year. Sung in unison or in two easy parts, with optional Readings to give background information on this wonderful Bible story, this is sure to be an instant favorite. Fun, sparkling track by Tim Hayden is the perfect accompaniment choice. This accessible arrangement of the familiar African American spiritual makes an ideal selection for older children's choirs as well as youth or adult choirs. A well-crafted accompaniment nicely supports the vocals while also painting a picture of Jericho's tumbling walls using descending chromatic patterns heard during the song's introduction and interludes. Performance / Accompaniment CD available. Gentle, expressive anthem incorporating the Charles Moody text (adapted by Ruth Elaine Schram). Suitable for Lent, Holy Week, or general use, and for worship services that focus on the theme of salvation or Christ's atoning death on the cross. It could also be used as an invitation piece at the end of a worship service or during a revival. Expressive new melody to the classic Latin text, arranged for Two Part voices. Antiphony and contrasting motion makes the harmony easy for younger choirs to learn and interesting for the listener. Good for general services, also appropriate for school use. Lovely new melody for the Latin text, artfully arranged for Two Part or Three Part Mixed voices. In the 3 Part version, Parts I and II (ladies' voices) sing the English, while Part III (mens' voices) sing the Latin. Three-Part version sounds particularly lush and full. Appropriate for school use also: a marvelous teaching tool for the classroom, and a wonderful choice for festivals or competitions. This gentle anthem takes its text from a beloved passage from the Gospel of John. Ruth Elaine Schram's musical setting brings just the right mood for the words, creating an anthem your choir and congregation will cherish. Particularly appropriate for services commemorating September 11. Start your Sunday morning service with this original praise anthem! "Let there be joy in this sanctuary, let there be harmony and love. Let there be song, let the music carry on the wings of praise to God above..." Beautiful and uplifting lyrics set to powerful, inspiring music makes this anthem the perfect choice to raise the spirits of your congregation. Both youth and adults will ask for this anthem! The traditional spiritual Little Lamb, Little Lamb, Little Innocent Lamb has been arranged for Unison and Two Part choirs. Easy to learn and to easy to teach, this offering is a great piece to introduce the traditional spiritual style, or just a treat for your singers! The text has been updated by the arranger to make it less confusing and more applicable to today's choirs. This traditional American folk hymn, while elegantly simple, has been given a fresh, stirring setting by Ruth Elaine Schram. An optional soaring flute obbligato is featured, while gorgeous vocal harmonies convey the image of the Great Spirit who comes in lofty flight to give rest to the weary. The richly flowing accompaniment underscores three modulating verses that gradually lift our souls to heaven. Suitable for Pentecost or General use. Thoughtful text by John Parker, set to stirring music by Ruth Elaine Schram, creating a beautiful work about how all our senses point us to our Creator and how our souls long for our Maker. Here on earth we express this longing through praise and worship, but our souls long for Him in every aspect of our life. Using the traditional English melody Royal Oak (All Things Bright and Beautiful), Ruthie has created an anthem that perfectly combines your adult choir, children (optional), and congregation (optional) in this lovely new setting. The optional Flute solo adds a crowning touch to this worshipful anthem that will be enjoyed by all ages. Suitable as a gentle call to worship any time of the year, especially during Lent, this simple song in fluid 3/4 meter may also be used to create a worshipful mood during the service prior to a scheduled invocation or before prayer time. "Lord, hear our prayer, hear our prayer; have mercy on us, have mercy on us..."
Expressive and lyrical, this song is rich with symbolism. "Love is like a rose ... a seed must be planted, weeded and watered, and patiently we wait for it to bloom ... It takes the sun to make the flowers reach up for the sky; it's the wintry wind that makes the roots dig deep into the earth..." Would be effective sung at weddings or church services focusing on the family; also suitable for general use. This anthem is quite versatile as it contains two texts: one to be used as a general anthem and the other as a benediction. Also, it can be performed in a shorter version as explained in the score. In each case, the text is well supported by the warm melody, lovely voice leading, and flowing accompaniment. It includes the time honored hymn, "God Be with You (Till We Meet Again)." An optional cello part is included in the score and adds further versatility. This lovely choral will truly help your congregation to sense the loving presence of our Lord in your worship service. Lovely arrangement of the familiar hymn arranged by Ruth Elaine Schram for four part mixed voices. Exquisite! Lowell Mason's classic hymn, made more familiar by its use in the movie, Titanic, has been arranged in a simply gorgeous setting. The text's comforting and prayerful thoughts are reflected in the moving and emotional choral arrangement by Ruth Elaine Schram and Walter Knapp, while the optional violin and cello lend an ethereal quality to this wistful arrangement. The musical quality is captivating and the stunning elegance will leave you and your congregation enveloped in the warmth of the Father's love! Ruth Elaine Schram has adapted one of the most cherished texts from the Psalms to create an exciting work about music. Geared specifically to today's choirs, this song is upbeat and powerfully moving. Dual texts have been provided to make this suitable for church or school use. Churches may wish to involve adult choir, youth choirs, or praise ensembles with either the full orchestration (by Julian Bond) or a rhythm section. Unforgettably gorgeous, lyrical setting of the First Corinthians "love" passage. Perfect for General use, Mother's Day, Father's Day, or weddings. Ruthie has dedicated this song to her daughter, Crystie, and her son-in-law, Dan, who were married December 30, 2000. A festive setting of the tune Lasst uns erfreuen. Not for children only, this would be a lovely addition to Easter or post-Easter worship sung by a girls or women's choir. Optional Flute part included in score. Here are some great anthems with that "one-rehearsal singability!" This volume delivers joyful songs of worship and soaring anthems of adoration, all highly accessible to choirs of all sizes. These two-part, SAB, and easy SATB chorals can be sung anytime and are guaranteed winners with a minimum of rehearsal time. From some of today's leading writers: Joseph M. Martin, Patti Drennan, Pepper Choplin, Stan Pethel, Ruth Elaine Schram, Don Besig, Nancy Price and others. A charming melody is coupled with an inspired text in this lovely anthem of devotion and consecration ..."Rain down on me your love and mercy, rain down on me your grace. Cleanse and renew my barren spirit in this quiet place..." Perfect for general use or for Pentecost. A musical admonition to seek first the Kingdom of God (based on Matthew 6:31-34 ) and not worry about our worldly needs. This work gently reminds us that God knows our every need and has promised that He provides. A memorable melody and lyrical, flowing accompaniment make this anthem guaranteed to please. Optional children's choir may be used to reinforce the child-like faith that God desires from us. This is an easy partner song by Linda Marcus and Ruth Elaine Schram, based on a Hebrew phrase with a very positive message for your singers and congregation. The words and melody are easy to remember and work as a canon, providing opportunities to teach about rounds, repeats, and the language of the Old Testament. Based upon the haunting "By the Waters of Babylon" folk tune, this gorgeous, poignant setting is a call for peace in three languages: Hebrew, Latin, and English. Set as a round, it will work for any combination of voices and will be easily learned by any age group. Optional instrumental parts for Cello and Two Violins (or Flute and Oboe) add depth and beauty to the flowing accompaniment in this piece that is equally effective for church and school. A very effective selection for 9/11 memorial services. Every church choir needs songs in their library that are easy to prepare for those times when the choir loft is not quite full. This collection of five easy to learn songs is written with the volunteer musician in mind and can be used throughout the church year. Each song is flexibly voiced for SAB voices or Two Part mixed voices (the alto part is optional throughout). This collection includes five songs, two of which have dual texts to be used for a specific season or for general use any time of the year. Three of the songs have optional instrumental obbligatos (including 2 clarinets, a flute, and a cello). Each song works as a "partner-type" duet, utilizing a familiar hymn melody for the vocalists with accessible ranges and voice leading. Songs include "Hymn of Grateful Praise" (Thanksgiving / General); "We'll Welcome Him" (Advent); "That First Silent Night" (Christmas); "Alleluia! Jesus Lives Today!" (Easter); and "Mercy and Grace" (Communion / General). The hymn tunes were carefully selected and the corresponding original material is deftly woven through the familiar material with meaningful texts, providing thought provoking and poignant moments in the worship service. Ruth Elaine Schram imparts a message of comfort and hope with this partner song pairing "Somebody Bigger than You and I" by Johnny Lange, Hy Heath, and Sonny Burke, with the familiar tune "He's Got the Whole World in His Hands." The result is a powerful song that will be popular with both your choir and your congregation. Optional a cappella beginning sets the tone for a worshipful moment. Give your ladies a Sunday off!! Terrific, upbeat arrangement of the lesser-known Spiritual for male voices. The music is so much fun, you may not even realize the import of the message: "We can all get lost in the storms of life!" Voiced TB with optional third part. Tender, expressive text by Bert Stratton is set to music by Ruth Elaine Schram which captures the spinning of the potter's wheel. The result is an important lesson: a life yielded to the will of God. Incorporating "Have Thine Own Way, Lord" presents the message with sensitivity and clarity. This energetic and upbeat anthem truly reflects its joyous text. Perfect for use at Pentecost, the music and lyrics are a positive message of the power of God's love in our lives. Scored for mixed voices, Piano, with optional Triangle and Bass parts included in the score. Developing choirs will love this fun medley of two traditional spirituals, "I'm Gonna Sing" and "Every Time I Feel the Spirit." Rhythmic and upbeat, the supportive accompaniment punctuates the rhythms while adding color and texture. The optional Descant provides an added opportunity for either a soloist or small group, and seamlessly ties the two tunes together. A Learning Resource Page is included and provides helpful teaching opportunities. Based on Phillipians 4:4-13, this lovely song is suitable for general use or services of Thanksgiving. "For all things that are lovely, for all things that are pure, for all things that are honest, for truth that will endure; think on these things, think on these things and be thankful ..." Hopeful and inspirational. Shawnee Press has introduced "Worship Songs Jr.," with songs specifically written for young voices. This set of three calls to worship includes "Come Into the House" based on Psalm 100, "Sing With Joy" based on Psalm 95, and "We Have Met to Worship" incorporating the hymn tune "Holy Manna" by George Atkins and William Moore. Each has optional Hand Bell parts (included in the score) and is bright and upbeat. A separate accompaniment CD is also available. Here is a warm, inviting anthem that is perfect for services centering on the family including Mother's Day, Father's Day, and Christian Family Sunday. This lovely setting features flowing harmonies supported by an expressive accompaniment that compliments the moving text. The addition of the children's voices will touch the hearts of all who hear it! A home and family winner! Peter Lutkin's famous "The Lord Bless You and Keep You" sets a high standard for choral benedictions. Joining it in this new edition is Ruth Elaine Schram's new benediction, "Help Us, Lord." Both are fitting ways to close any worship service or church community gathering, and will serve your needs for years to come. Appropriate for use during the entire church year, this anthem is intended to be easily learned and presented with selected sections teachable to the congregation. (Reproducible part for Congregation is included on back page.) It is flexible in design and can be used as a complete anthem or a simple benediction. Incorporating the popular South African Folksong "Siyahamba;" choirs may alternate singing the English words with the Zulu text. 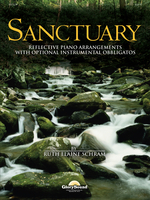 In this combination of two familiar and beloved spirituals, Ruth Elaine Schram has crafted a thoughtful and captivating medley suitable for both church and school use. Beginning with "We must walk this lonesome valley, we have to walk it by ourselves..." then culminating in the invitation, "But I want You, Lord, to walk with me..." Gorgeous chords permeate the vocals and piano accompaniment, both of which are further strengthened by an optional cello obbligato which is included in the score. Available in multiple voicings. This beautiful piece weaves portions of the well-known hymns "Brethren, We Have Met to Worship" and "Amazing Grace" with original words and music. The text reminds us why we gather together in our places of worship: to confess our shortcomings, to receive God's grace, to bring Him our hopes and our cares, to unite in prayer and praise. This work resonates with a gentle reverence, as portions of the hymns are sung by the men underneath the original music sung by the ladies. The modulation into the last verse is unique and dramatic, in that the singers will actually be singing in a lower key than before. This piece can be a very moving musical and spiritual experience! Thoughtful text by J. Paul Williams set for SAB voices (in conservative three-part-mixed ranges) by Ruth Elaine Schram. Perfect for stewardship emphases, or any time an anthem of praise and thanksgiving is desired. Suitable for developing voices as well as adult ensembles. "We come to you for healing, Lord, of body, mind, and soul, and pray that by your Spirit's touch our lives may be made whole...." Every believer can identify with this gentle prayer for healing (text by Herman M. Stuempfle) as they pass through times of difficulty and struggle. A gem for mixed voices and piano with flute obbligato (included in score), artfully set by Ruth Elaine Schram, suitable for Pentecost or general use. With text based on Psalm 33, Ruth Elaine Schram offers us an original SAB arrangement that meets the needs of so many choirs. With reverence and anticipation, this lovely anthem is perfect for the smaller ensemble. "What makes me sing? It's your love, your unfailing love. I will sing of your love, forever!" With beautiful, full harmonies, this anthem has been written with great care! Originally one of the songs in the "Psalms for a New Time" collection. Beautiful poem by Errol Elliott, adapted by Dave Davenport and set by Ruth Elaine Schram explores the various traits of God's character. With a Joyful Noise New! With What Shall I Come? New for SAB / Two-part Mixed! Although this is an anthem suitable for general use, it would be particularly appropriate for stewardship emphasis or as an offertory. Based on Micah 6:6-8, Ruthie Schram's inspired treatment of this text is set in a minor mode, enhancing the essence of the scripture. A creative inclusion of a portion of the familiar Isaac Watts text "Love so amazing, so divine, demands my soul, my life, my all" is a fitting culmination and response to the opening question of the anthem. This orchestration premiered by Settle Memorial United Methodist Church, Owensboro, Kentucky. What fun!! Delightful medley of "Grace" hymns, beginning with "Wonderful Grace of Jesus" by Haldor Lillenas, moving on to "Grace Greater Than Our Sin" by Julia Johnston and Daniel Towner, and quoting "Amazing Grace." Arranged by the creative duo of Walter Knapp and Ruth Elaine Schram, you will need an accomplished accompanist to keep up! This anthem based on Psalm 139 is great for teaching the doctrine of the care of God for each individual. "I am wonderfully made, by my God, wonderfully made!" Scored for Two Part Treble, this will appeal to youth choirs as well as children's choirs. The Words of My Mouth New! "May the words of my mouth be pleasing in your heart, O Lord." Based upon Psalms 19:14 and 145:21, this thoughtful anthem, set in E minor, is hauntingly beautiful. Scored for unison or two-part voices with modest vocal ranges, it teaches important truths to young hearts. Lovely general anthem of praise suitable all year long. Easy SATB writing includes many unison / two part mixed passages and limited ranges. Consider using for Pentecost as well as throughout the church year. This Ruth Elaine Schram original is based upon Psalm 23. Stirring and comforting, this setting presents two equal parts for children's choir. The intimate accompaniment brings together this truly breathtaking arrangement. Accompaniment / Performance CD available. For family emphasis services, child dedications, baptisms or Mother's Day/Father's Day services, this anthem by Jan McGuire and Ruth Elaine Schram is a great choice. Dual texts insure the right words for the various occasions, making this a very flexible and useful addition to your library. The optional flute obbligato adds a serene touch and the piano accompaniment is rhythmically supportive. Voiced for SAB with cues for SATB. BonusTrax CD is available. Lyrical, expressive song of assurance based on the familiar passage in Romans 8. Suitable any time during the church year but particularly meaningful during Lent when our thoughts turn to God's love and Christ's sacrifice for us.